Nahant selectman Enzo Barile (left) and state Senator Brendan Crighton toured the coastline last week. They looked at a sidewalk near Short Beach that was damaged by winter storms. From Cape Cod to Cape Ann, this winter’s devastating succession of coastal storms has left a lasting mark on the state’s beaches — sand dunes washed away, staircases obliterated by record tides, sea walls reduced to rubble. As residents prepare for the approaching beach season, much of the state’s coastline remains in rough shape, facing a slow, costly recovery from the extensive damage. On Good Harbor Beach in Gloucester, sand dunes have been cut in half. In Nahant, where the state spent nearly $20 million in recent years to protect its causeway, newly built bluffs were swept out to sea. In Sandwich on Cape Cod, where local officials have long struggled to maintain a barrier of protective sand on Town Neck Beach, surging tides damaged coastal homes. In addition to the damage to at least 2,113 homes along the coast, the state Office of Coastal Zone Management had reported “widespread beach and dune erosion,” and buildings and sea walls were damaged from Salisbury to Chatham. “Beach access structures and boat ramps were undermined and damaged or destroyed, and many floats, piers, docks, and boats were damaged or displaced,” he wrote. As state officials await a decision, coastal communities are scrambling to clean up the damage in time for summer. In Sandwich, town officials two years ago spent $3 million to bolster a local beach with about 120,000 cubic yards of sand dredged from the Cape Cod Canal. The storms also damaged the town’s boardwalk, dumped sediment into a nearby marsh, and severely damaged some 15 homes, including one that had to be taken down. “It’s fair to say the damage here alone was in the millions of dollars,” Dunham said. In Gloucester, city officials placed the damage cost as high as $14 million. Without federal disaster assistance, they would have to postpone large improvement projects, such as rebuilding sea walls and piers, they said. Governor Charlie Baker (left) walked on a sea wall at Stage Fort Park with State Senator Bruce Tarr on March 4, after a weekend storm. Moments earlier, they had gotten wet from a crashing wave. Besides Good Harbor, the city’s other popular beaches, such as Wingaersheek, suffered “major damage,” with footbridges and piers destroyed, said Jim Destino, the city’s chief administrative officer. City workers were out this week rushing to rebuild sea walls, restore damaged paths, and clean up beaches strewn with rocks and boulders. “We’ve done a lot of work to recover, but there’s a lot of work that remains,” Destino said. In Quincy, officials estimate the city sustained more than $10 million in damage to sea walls, roads, sidewalks, and other property in the March storm, which flooded 130 homes and forced 500 people to evacuate. At Wollaston Beach, large rocks still cover significant portions of the sand, and a beach staircase remains in tatters. A concrete slab from a damaged sea wall lies nearby. “The extensive damage to sea walls has left portions of the city vulnerable to repetitive flooding during normal monthly high tide,” Baker wrote in his letter to Trump. On Nantasket Beach in Hull, where winter storms caused an estimated $1 million in damage, portions of the beach remain covered in detritus that washed up during the nor’easters. One home facing the ocean still has a front lawn filled with cobble rocks, while foul-smelling seaweed is piled in heaps of sand. 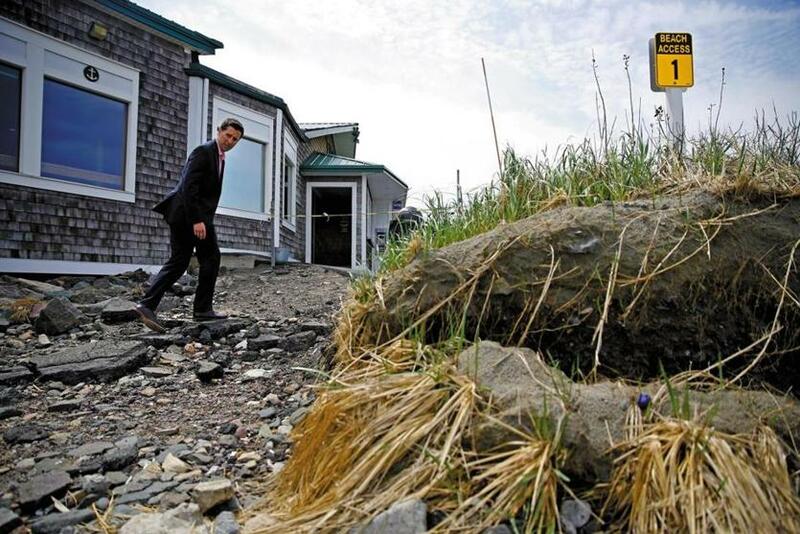 As he pointed to a section of a sea wall that had been swept away, Christian Krahforst, the town’s conservation administrator, said many of the existing homes would have to make expensive changes to survive future storms. 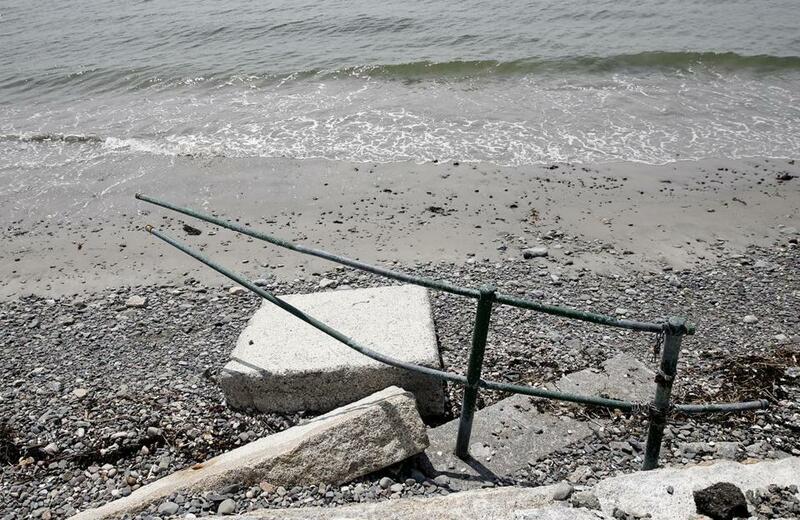 A section of railing along Nahant’s Tudor Beach was damaged by the winter storms. 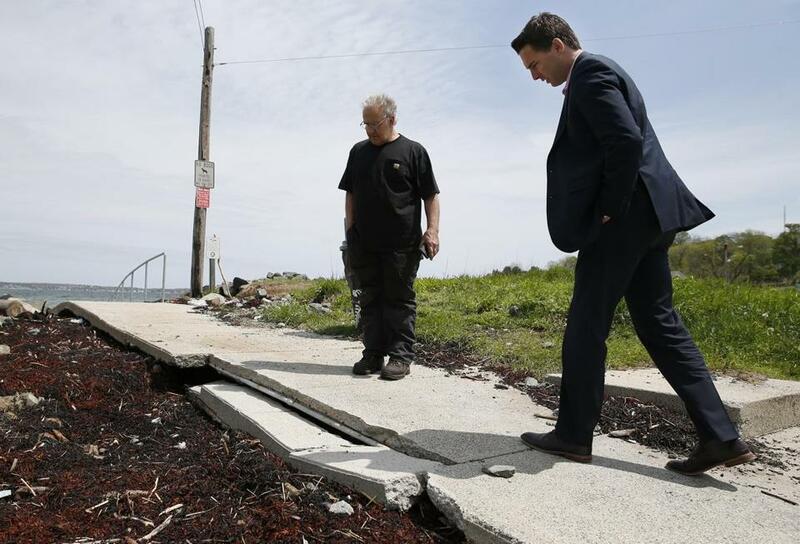 On a recent tour of the damage in Nahant, state Senator Brendan Crighton pointed to where a large, newly built dune used to protect the causeway. “It looks like an asteroid hit it,” he said. Without such dunes, future storms could swamp the causeway and ultimately sever Nahant from the mainland, he said. “This is why we need long-term planning,” he said. State officials, who could not provide a damage assessment for the 14 beaches managed by the Department of Conservation and Recreation, said they’re working “diligently to prepare its properties for the millions of people” who visit them every summer. They said the governor has filed legislation that would provide $300 million in aid for coastal communities to prepare for rising seas, inland flooding, and other potential effects of climate change. That legislation remains pending. “Climate change is here, and these storms are going to keep getting worse,” said Daniel Sieger, the state’s assistant secretary for environmental issues. He said there was only so much that could be done to protect the coast from natural forces, as sea levels are predicted to rise by several feet in the coming decades. But the state will continue to nourish beaches with more sand, he said. “Beaches are the Commonwealth’s first line of defense . . . to respond to and prepare for extreme weather,” he said. Crighton pointed out some of the widespread damage near Short Beach.